That nursing is the largest single component of Australia’s mental health workforce isn’t a surprise. 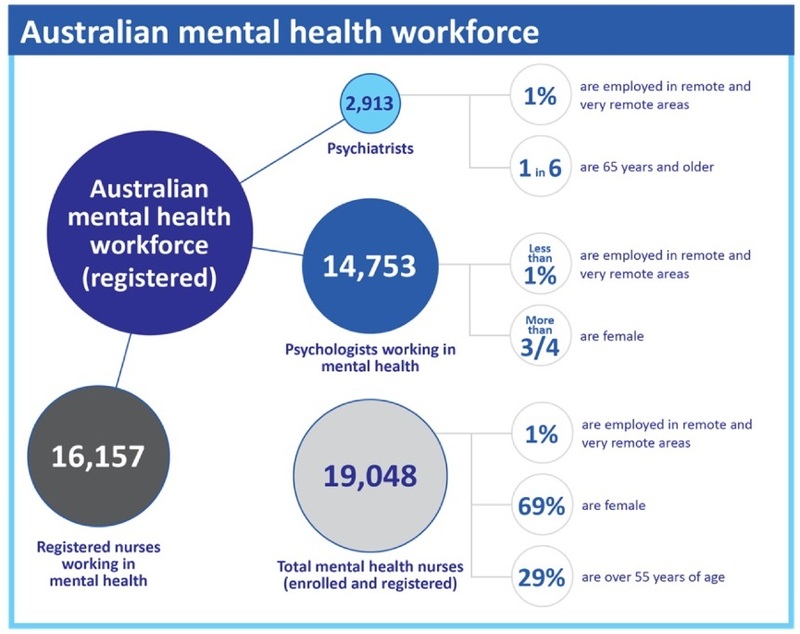 What is a bit unsettling is that the big bubble with 19,048 in it is mislabeled as “Total mental health nurses”. Working in mental health does not make you a mental health nurse, in the same way as driving through Bathurst does not make you a racing car driver. Just because you have a basic licence and you are in the right setting, it doesn’t mean you have the skills to perform safely at a high standard. It doesn’t mean you have cred. Medicine and nursing do not correlate on every detail of specialisation, but still… why such a big disparity between the two in terms of registration? Australians have rated Nurses as the most ethical and honest profession each year for 21 years in a row (1994-2015) [source], but I wonder if the public is aware of a problem with nursing specialities not being given the similar recognition as medical specialities. Midwives have made their speciality distinctly different in the eyes of the public and other health professionals. I am sure it is a comfort for many expectant parents to know that the person guiding you through pregnancy, labour, childbirth and early parenthood is a qualified specialist and is acknowledged and registered as such. However, people receiving support/treatment for a mental health condition will not necessarily have a specialist mental health nurse providing that service. It’s quite the opposite of midwifery – the nurse providing care may have no specialised qualifications in mental health. I wonder how service users and the people who love them feel about that. I’ve been a medical, surgical and high-dependency/ICU nurse, and have worked closely with Midwives. I can tell you with confidence that mental health nursing is as different from general nursing as midwifery is. There are some transferable skills, of course, but midwifery, general nursing and mental health nursing each have a completely different model of care, and a very different way of working with people. 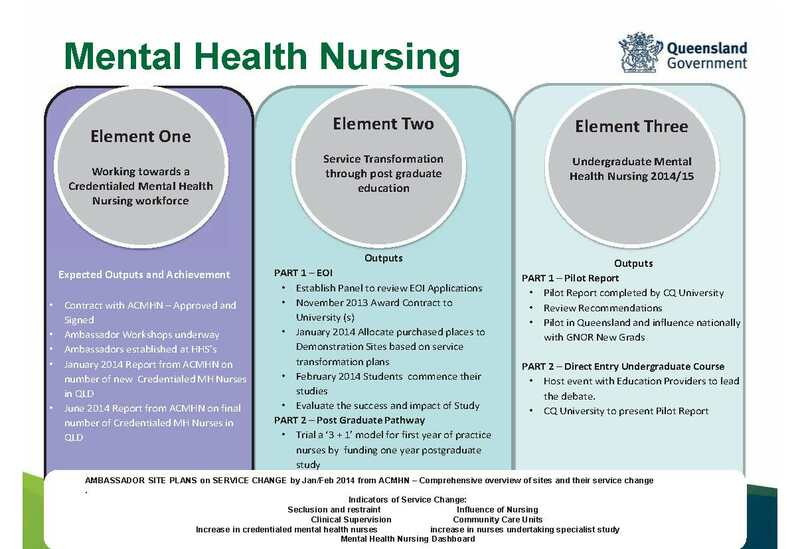 There’s more good news: Queensland Health has set targets to work towards a fully qualified, fully credentialed mental health nursing workforce. I wonder if other state health departments are thinking about implementing a similar strategy. It might be important: a program staffed entirely by Credentialed Mental Health Nurses was described as “one of the most innovative services ever funded” [source]. Credentialing + Ability = Credibility. Credentialed Mental Health Nurses have Cred. Every speciality area of nursing, every healthcare organisation, and every patient needs the same thing: Nurses with Cred. That’s it, as always your comments are welcome. This entry was posted in Blog and tagged ACMHN, credentialing, mental health, nurse, nurses, nursing on 28 April 2015 by Paul McNamara. You are so right. The general public is not aware that we have clinical specialties and have expertise in different roles. Education, education, education! As a credentialed mental health nurse with original certificate as Registered Psychiatric Nurse (now outdated) and surpassed by Diploma and Masters at tertiary level, I could not agree more. If we are to provide a career pathway for those who will follow in our footsteps we must support credentialing and specialist recognition.